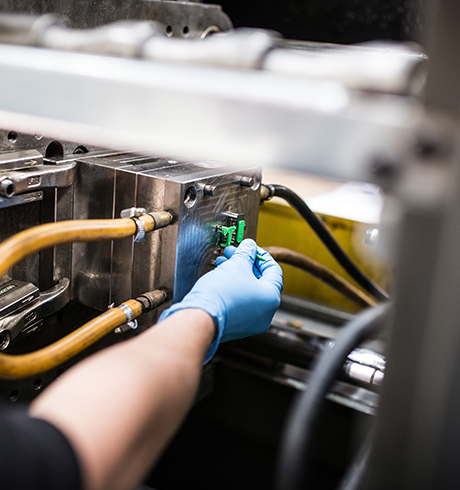 With moulding capabilities ranging from 30-1,300 tonnes and over 20 hydraulic and all-electric injection moulding machines within our three group facilities, we are able to offer our customers both low volume injection moulding and high volume injection moulding as part of our turn-key solution service. Our highly motivated team are fully trained in both hand-loaded development tooling and fully automated tools depending upon the volume and the speed requirements of your plastic injected components. We can provide your injection moulded parts in any standard injection mouldable polymer and in any volume you require. In addition, we can over-mould any number of threaded inserts, metal fret connectors or other plastic injection moulded parts to give your product a professional finish. To enquire about our plastic injection moulding capabilities and what we can offer you, contact us today. We also offer rapid tooling, prototyping and post moulding services. With the ability to produce a great amount of identical components, injection moulding is one of the most popular methods to manufacture plastic products. Plastic is everywhere, whether it be the interior of our car, kitchen utensils or medical devices. Here we discuss the process of plastic injection moulding and the stages it entails before polymer material becomes a plastic product. The process begins with an injection mould tool, which depending on the volumes of the plastic components will typically be made from aluminium or P20 steel, although there are other alternatives available such as Toolox 44 and fully hardened H13 steel. Once cut and ready, the injection mould tool is fitted into an injection mould press and the polymer is melted down with the use of a heated barrel which is fitted it the press. With a reciprocating screw the melted polymer is fed through to the mould via a channel system of gates and runners as it takes the desired shape of the component. The injection moulding process includes five main stages, all of which are listed and explained below. Refers to the pressure which is produced from the machine to the mould during the injection and cooling process. Once melted down the polymer is fed through the gates and into the mould where it forms its desired shape. During the injection process there is a pause in the process which enables the plastic to fill each of the mould cavities to ensure proper shape. Whilst still in the mould the now plastic product is given time to cool in the mould. Following the above process the mould tool opens to release the complete product before it is quality checked and put through any required post mould operations. For all your plastic injection moulding questions, queries or quote requests, please don't hesitate to contact us. Our skilled and knowledgable team are waiting to discuss your requirements.